This week, the posse consisted of just Jim and myself; Julian being stuck down a hole somewhere, and Andrew being off chasing the ghost of the Northern Pacific. Between this and a previous session with Andrew, we have most of the ties laid. The trick to placing ties quickly and accurately is a tie jig, which my daughter helped me build a couple of months ago. It could hardly be simpler, but it saves a lot of faffing with glue and individual sticks of wood. My jig is about two feet long because that was the length of the plywood scrap I made it from. You could probably handle a three-footer (1 metre), but beyond that the strips of masking tape with ties on them will appear to become self-aware, and try to confound you by getting tangled. The Kappler ties I’m using are at least a decade old, and there is tremendous variation in the width. I understand that you don’t see that nowadays. I wish I’d built my jig with a wider tie in mind, as I had to discard quite a few ties that didn’t fit in the jig and that upsets the Scottish side of my nature. Andrew reminded me that you don’t want the jig too tight as that makes it difficult to get the tie strips out later. 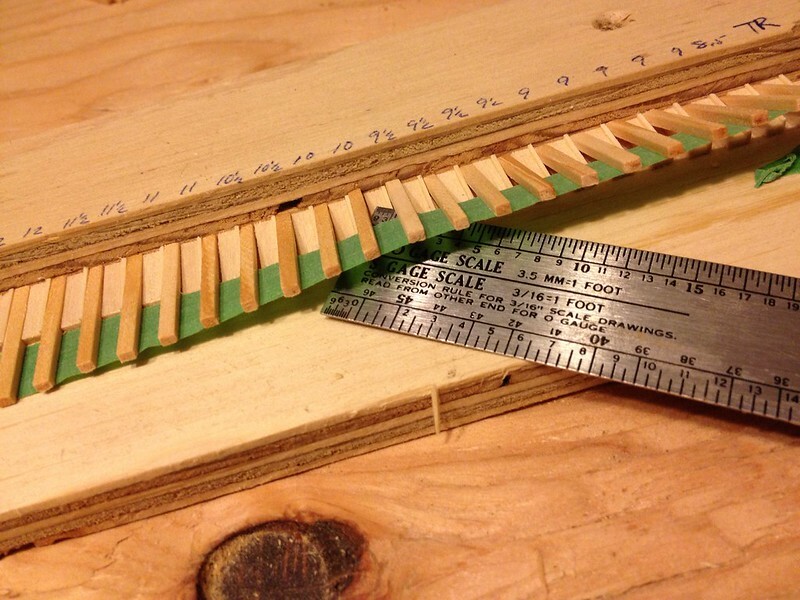 Because some of the ties are a bit tight in the jig, the tie strips don’t fall out easily. 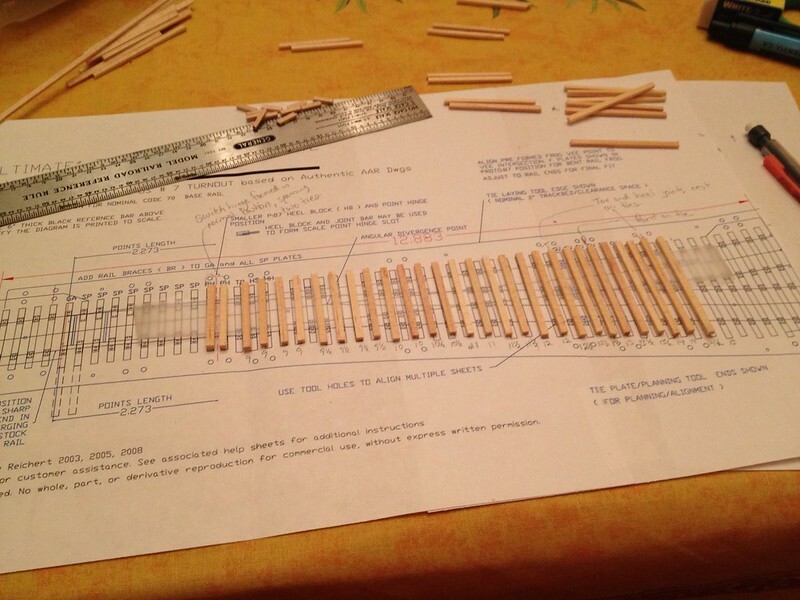 I wind up prying them up with a ruler so only the ends of the ties are still in the jig. Then the strip comes out without further resistance. Note that the ties are laid on top of the masking tape, rather than the other way around. I don’t know if this is important or not, but when Tom Hood showed me how to use a similar jig when I was a teenager, this is what he did. I think if you put the masking tape on top of the ties, it’s likely to sag between ties, and the resulting spacing will be inaccurate. I mark the middle of the occasional tie before I place them on the masking tape (mark down); these marks help to place the strip on the centre lines we laid out before. 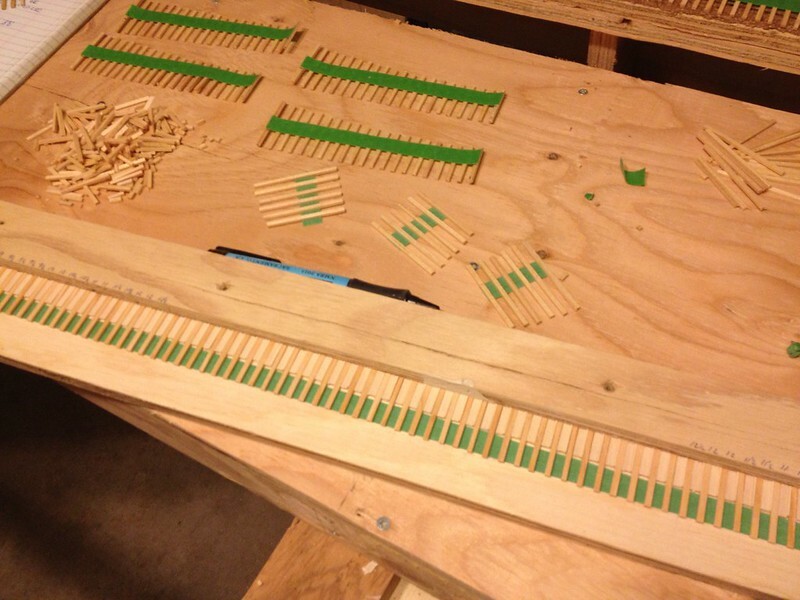 I also used the jig to lay out the ties through the leads of my turnouts. The frogs and points will get special treatment, but the lead is basically plain track that happens to overlap. 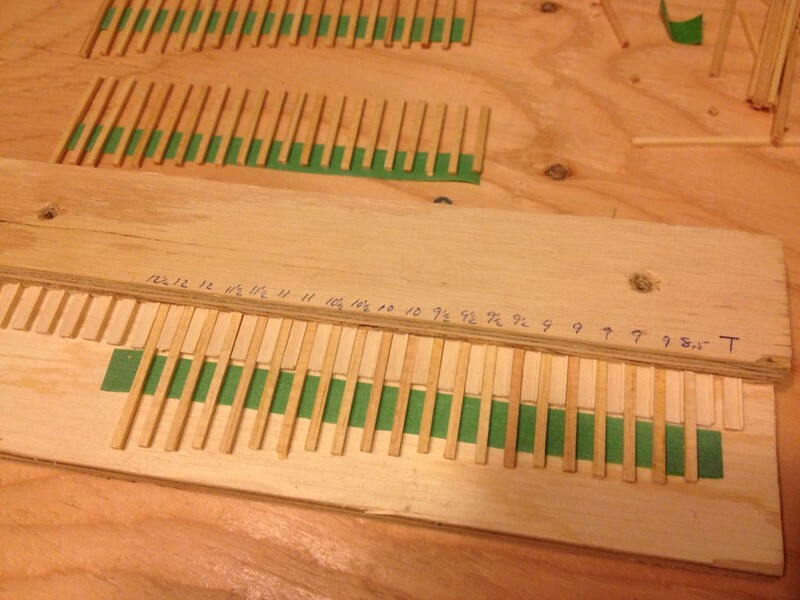 To make this easier, I wrote the tie lengths on the jig; then it was simply a matter of controlling the piles of ties and plunking them in the appropriate slots. When all is said and done, we need a little less imagination to see where the tracks are going to go. You can see now that there is not much space at the end of the ties before the embankment drops down into the river. Indeed, Jim pointed out that they’re under-cut for a short ways. That is accurate for Pembroke, and we will have the head-block ties of a couple of turnouts sticking out in thin air. One final note: make sure the glue is dry before taking the masking tape off! This week, after a short hiatus to visit my family, I’m doing more figuring on how a Canada Atlantic turnout must have looked. “What, can’t we just pull some standard drawings from the AREA and use those?” I hear you asking. Well, no, we can’t and for that reason, we also can’t use the excellent kits from the Proto:87 Stores either. Of course, we know relatively little about the track in Pembroke. We know that the tie spacing was 24.75 inches. This typically would be the spacing through the lead of the turnout. If we tighten the ties up to 20″ or less, it’s going to look like someone plunked a more modern turnout into the yard. So, we’d better have that spacing. We also know that every Canada Atlantic joint bar in the photographs is centered over a tie, rather than spanning two ties, as is typical today. Assuming the frog was not built on site, we can guess that the toe and the heel of the frog would have been supported by ties, as the frog point would be too. At the other end, I don’t know how the heel of the switch works. On the one hand, it could be supported by a tie as with the other joints. On the other, it could be in the space between ties, which is how you’d build it today. I’m going to go with the former. I started trying to figure out all the leads and spacing on paper, and finally decided I should just cut some ties and lay it out on one of the Proto:87 Stores templates (thanks again Andy). Seeing it mocked up on the template enabled me to affirm that it’s going to look okay. I started by placing the ties for the heel of the switch and the toe, heel and point of the frog. Through the frog, I simply spaced the ties by eye. There are two between the toe and the frog point, and three between frog point and the heel. They are about 20″ on center. The lead is all regular spacing until three ties from the heel of the point. There they get closer again. Looking at drawings for other turnouts, this seems to be a common location for tighter tie spacing. Possibly there is some extra force near the heel of the switch, or perhaps the designers work like I do, and simply find a place to accommodate the desired lead length and the tie spacing. I didn’t bother with the switch itself. I am considering printing these complete with rail braces. But more to point, I was out of ties, and it’s time for bed! Working with Julian Watson on his Victorian Railways modules (http://vrdays.blogspot.com) we came across the problem of how to represent VR switches. His branch had a delightful lack of tie plates, and so, the first problem was how to reduce the thickness of the ties to allow for the slide plates. The second was how to represent the peculiar VR rail braces. The Proto:87 Stores (http:www.proto87.com) sells some very nice museum-quality rail braces and etched slide chairs, but the rail braces won’t match the VR, and we would still be left with the problem of accurately reducing the tie thickness. I had been thinking for some time about 3D printing the ties for a switch complete with rail braces and slide plates. So we decided to give it a whirl on Julian’s layout. We started with official VR drawings, along with some good detailed black and white photographs, which Julian had. In an evening, with Julian and Andrew watching, I worked up a SketchUp drawing of the ties and rail braces. We then uploaded the drawing to Shapeways and a couple of weeks later had the casting shown in the photo above made out of their White Strong Flexible sintered nylon material. Unfortunately, the WSF didn’t quite resolve the rail braces, and so, most of them have disappeared. Their White Detail material will probably give a better balance between detail and cost, and so, we will try that next time. For the proof of concept shown above, we glued the rail in place with Pliobond. The switch rod is PC board, and the points were hand-filed on three planes to a rather dodgy, but workable profile (the pukka ones from Proto:87 Stores would be better). 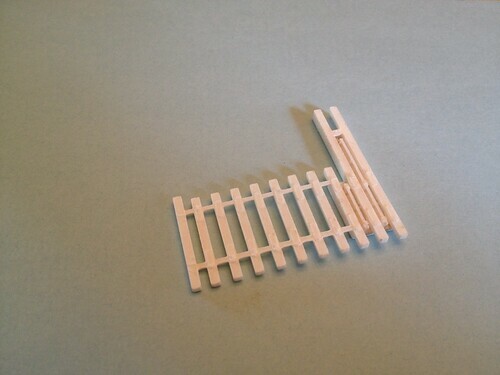 Notice that the prototype’s diverging stock rail bends near the tie before the points. This is a critical detail, and provided it is replicated, the points sit tight enough to the stock rails to work nicely. Overall, we declared the experiment to be an interim success, and with a little further refinement of the model, we will go ahead and print all of them for Julian’s model. I also worked up a standard gauge version based on a CPR drawing. This one has a printed switch rod, which is meant to slide beneath the head blocks. Unfortunately, the tolerances are too tight, and so, it doesn’t really slide. It also incorporates a detente to hold the points over firmly, but I made the switch rod too well, and that doesn’t work either. It shows promise, though, and is pictured below. Last night was a hideous night for driving to Langley. The roads were deep and shining with rain, and in traffic my windshield wipers could barely keep up. As with most North Vancouverites, I rarely go across the Second Narrows, much less the Port Mann Bridge, and so, of course we missed our turn and overshot. Fortunately, Julian had his phone with him and was able to redirect me back to the true path. Jim Peters was our gracious host for the evening. And thrust drinks into our hands as soon as we were in the door; that helped to cool our nerves after the drive. Jim has started benchwork for his model of a chunk of Prince Rupert yard. The yard throat will be to scale, although he’s elided a few tracks. He will also replace the western-most turnouts with a sector plate to save a little more room. In an unusual solution to prototype modeling in a small space, the mainline will curve across two of the yard tracks so it can avoid disappearing out the window, and follow the walls around to a small staging yard behind his drafting table. 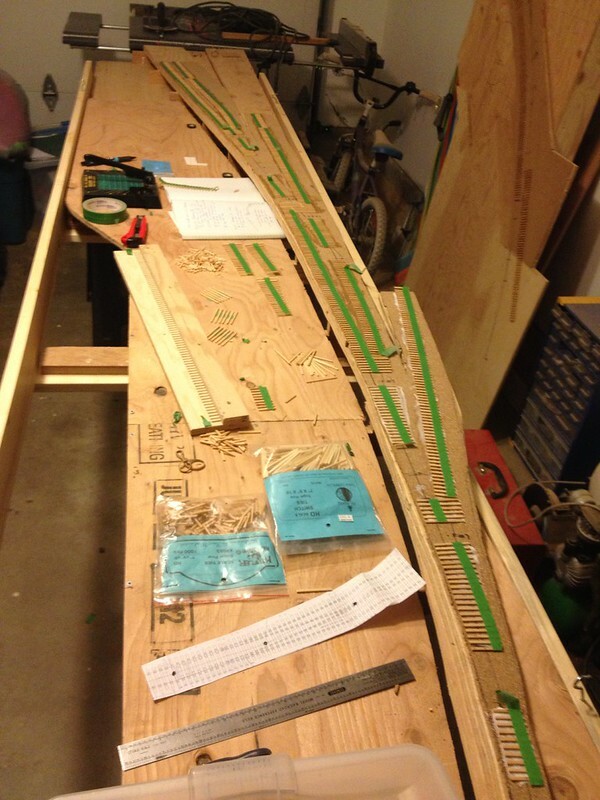 Jim’s not quite committed to Proto:87 yet as he’s unsure if he can build track that will work. At the last meeting we realized that most of the Posse are in the same boat and have never built a turnout before. So we brought along Brian Pate, who has built more track than anyone I know. With Brian, we had a little hand-laying mini-clinic right in Jim’s train room. Brian provided some short instruction and then a couple of us sallied forth with soldering irons blazing. Key takeaways for me were that Brian only uses PC board ties through his turnouts, rather than mixing PC board and wood as many people do. He tins all his ties as well as the underside of his rail. He builds all his turnouts on full-size templates off the layout; the template is affixed to his favorite piece of plywood with Lepage spray on adhesive, and the ties are glued down with Lepage Hobby Cement. 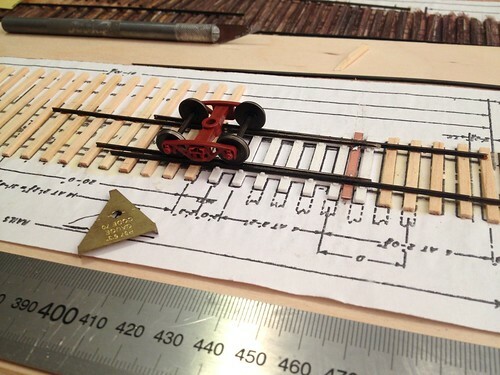 These both dissolve with lacquer thinner when he’s finished the soldering and ready to move the track to the layout. Between turnouts, Brian uses flex track. Unfortunately, we hadn’t room for everyone to sling their solder, and so, most watched and listened. I built a curved number 7 because Chris declared he couldn’t understand how to make curved turnouts work. Brian already had a turnout under construction. We take different approaches to building turnouts. Brian uses the method that I was originally taught many years ago: lay the two stock rails, and then joggle the frog around until it is in perfect gauge relative to the stock rails. Brian’s is the easier way to build track, but it typically results in the point of the frog falling wherever it wants to, rather than on a specific tie as per the prototype. Since people started nit-picking my track, I’ve been gauging the frog to one stock rail, then laying the other stock rail to the frog. Unfortunately, I didn’t bring anything to pin my rail down with as I was soldering it, and so, the gauge on the diverging route got kind of wonky. In particular the flangeway was much too wide, and we got a good demonstration of why that is no good when I ran a truck through. The main route was perfect, however, and a truck ran through nicely without a guard rail. I think everyone finished the night with a little more knowledge and inspiration to try out handlaying themselves. Next meetup is tentatively schedule for Julian’s place. I’m hoping for every extra month I can get as my basement is nowhere near ready to host the posse!